Luxor Nobles tombs is locat The site has rock cut tombs of Nobles, and high officials of ancient Egypt,ed on the west bank of Luxor, in an area called Sheik Abd El-Korna. who once served the Pharaohs during the time of the New Kingdom. 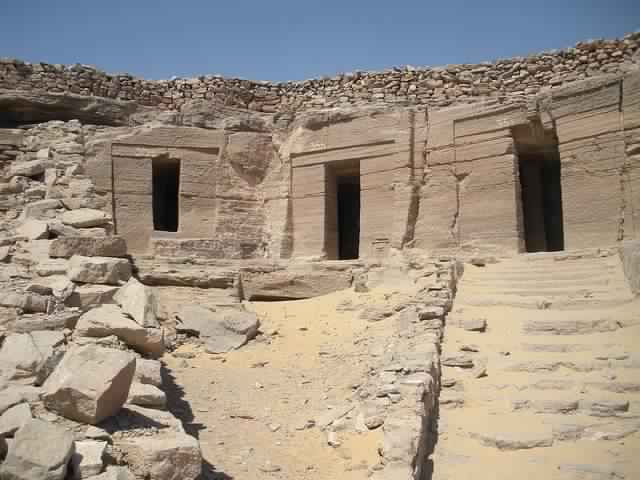 (1500 – 500 BC) Among the most important tombs in this cemetery is the tomb numbered 55, which belonged to Ra-Mose. He was the mayor of Thebes, and during the end of the reign of Amenhotep III (Amenophis III) and his son Akhenaton, the vizier. Unfortunately this tomb is unfinished because Ra-Mose moved, with Akhenaton, to the new capital Akht-Aton (modern day Tell El-Amarna), therefore the decoration work stopped, and the tomb was left unfinished, except for the scenes which already had been completed. Because of this, we can appreciate the high techniques that Egyptian art had during that period. This tomb consists of a square rock-cut court, with a central doorway, opening into a broad columned hall with columns in the papyrus bud form. The inner hall is undercoated! On the left of the broad hall, and under the inner hall, were shafts’ leading below to two burial chambers, but the mummy of Ra-Mose was not found. The relief carving in this chapel is very fine and only some parts were painted. The tomb numbered 100 is another one of the important tombs in this cemetery; it belonged to Re-khme–e, who was vizier of Tuthmosis III and Amenhotep II. It is another rock cut tomb and its walls are decorated with many painted scenes of the various aspects of life in Ancient Egypt. One of the most beautiful scenes is the one that represents the arrival of the foreign delegations to the court of the Vizier Re-khme-Re, carrying presents and tributes to the King of Egypt and his men. These presents and tributes included items such as, utensils, agricultural products and various animals. One of the most important text engraves in the this tomb is the one which mentions the duties and responsibilities assumed by the vizier in order to let the justice prevail on Earth. When you visit the tombs, it is very important to know the number of the tomb you want to visit. This way you can visit exactly what you want to see; otherwise you will be lost, as many of the names of the Nobles are similar.